Lefka is quite a find,having travelled extensively throughout Greece these apartments are the best we've stayed in,the complex is like a small oasis.Rooms are up to date and always spotless,food excellent,pool clean and beautifully tended gardens.The hosts Evita and Andreas are truly lovely people and are complemented by the two equally lovely Maria's .We'll be back soon! Our first visit but unlikely to be the last.We needed a relaxing break and this is just what we got. Nothing was too much trouble for Andreas, Evita and the two Maria's and everything is kept spotlessly clean by the ever cheerful Dimitra. Normally we like to hire a car and drive here there and everywhere but on this occasion we felt that we needed to just chill and recharge our batteries. As others have said everything you need is here. The bar serves food and drink throughout the day, there is a supermarket across the road a great pool that was never crowded and you are just a short walk to a lovely sandy beach. In addition there is a bus stop right outside with busses into Chania every 20 mins from 6 in the morning to midnight. Next time we think we will hire a car at least for part of the holiday to see a bit more of western Crete and have a slightly different holiday at Lefka. Thank you Andreas and Evita we needed a relaxing break and got exactly that. Yet another fantastic stay at Lefka. We love everything about this place. Where else can you have a lovely apartment with balcony overlooking either gardens or pool (great pool and never any problem getting a sun bed either), fabulous people, great food and drink on site, and still within easy reach of beautiful Chania- but also on the road if you wish to visit more of this part of Crete either by bus or car. Andreas, Evita and the Marias do everything to ensure a great holiday and the apartments are kept spotless by Dimitra the cheery cleaning lady. 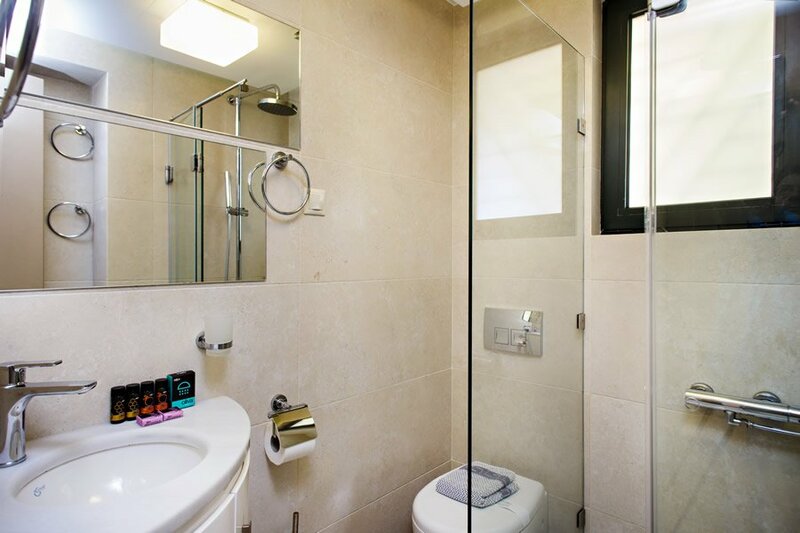 Since our last visit the bathrooms have been upgraded and the soft furnishings too. This place is well looked after. Another big plus this year was the new beach bar at the local Aptera Beach. Very nice with good sun loungers, good food and nice staff. We just love coming here and will return again and again. We really enjoyed our stay at Lefka Apartments. Andreas and Evita are the owners and he is hilarious and she is very sweet. A warm and Cretan friendly family welcome to this spotlessly clean apartment and clear blue pool located in the peace of tropical plants and trees was a wonderful way to get away from any stress! Beach 10 mins walk or 5 mins on the bus, Chania 10 min bus ride away and bus stops outside apartments and lovely large supermarket opposite. Everything was perfect. Thank you for a beautiful week. Just returned from our eighth visit to Lefka. The best compliment I can give is to say that it always feels like going to stay with amazing friends. Andrea and Evita, wonderfully supported by both Marias , always make staying here special. The food is amazing and Andreas makes incredible cocktails. There is always a good mix of nationalities staying at Lefka, many repeat returners like ourselves, and the conversation flows easily. 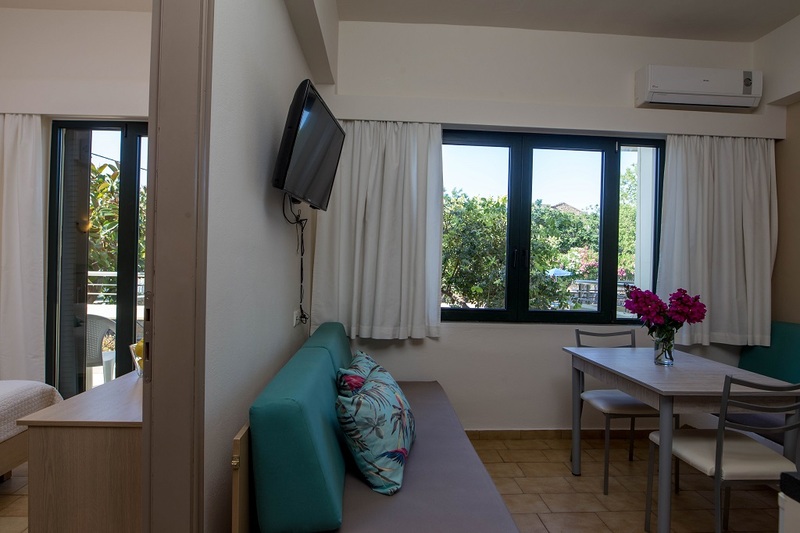 The apartments themselves are immaculate and well equipped . As for location there is an excellent supermarket across the road, an excellent beach with new facilities is 10 minutes walk away. A 10 minute bus ride will get you into Chania or you could walk via the beach....approximately 20 minutes. Sad to have just left....looking forward to returning next year. If anyone is considering staying here I can guarantee you won't be disappointed. Look for no other place !!! Our 4th stay in a row at this outstanding property in Chania. Same familiar and personal care from Evita, Andreas and their staff, which once again reminded us the meaning of Cretan hospitality. No need for long descriptions and endless words. Stay at his place and you won't regret it !!! A hidden gem of apartments that can't be overlooked. Fantastic hosts with Andreas and Evita with morning and evening Maria's they all make such a good team ensuring your stay is enjoyable in every sense. We stayed in a one bedroom apartment whilst our older children (17 & 21) stayed in a studio apartment. Both apartments were spacious comfortable and very clean. 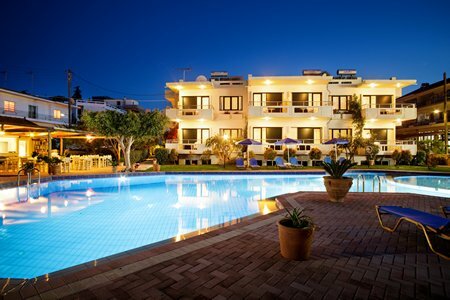 Location is excellent for beaches/supermarkets/trips to Chania & further afield. Whilst on holiday my husband celebrated his 50th and Andreas very kindly surprised us with a birthday cake which we were very touched by and it was lovely to share the celebration with others at the bar that night. 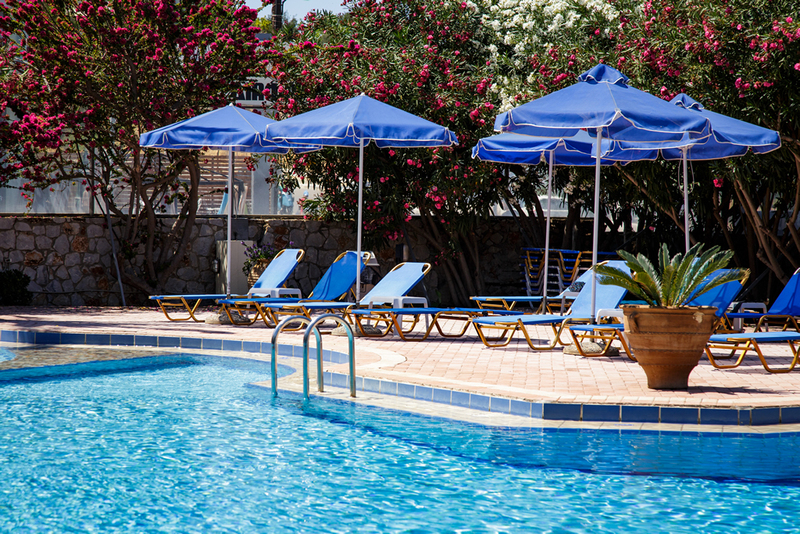 Lefka apartments are more than just holiday apartments they are are a slice of Crete with the most fantastic hospitality that we have been lucky enough to experience twice. Thank you for a wonderful holiday. I've stayed here many times over the past 15 years and it just gets better and better. 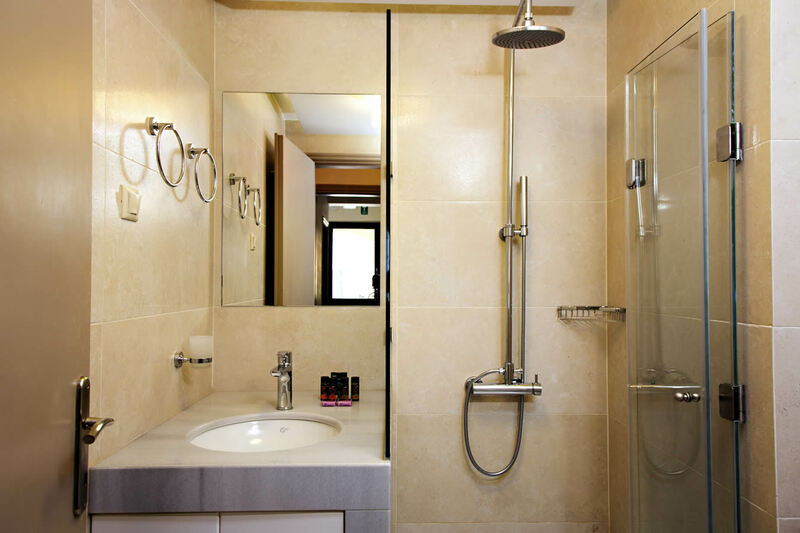 The apartments are clean, comfortable and very well equipped. I prefer the rooms overlooking the pool but the garden views are also really good and a bit quieter. While the apartments are great, it's the warm welcome you get each year from the owners that make this place the best you'll find in Chania. Andreas and Evita go the extra mile to make you feel at home and ensure you have a fun filled and relaxing holiday. The bar is the hub and apart from the excellent food, the atmosphere is brilliant and there is always plenty of craic! Lefka apartments offer charming self catering accommodation for your holidays in Chania (or Hania) and Crete. 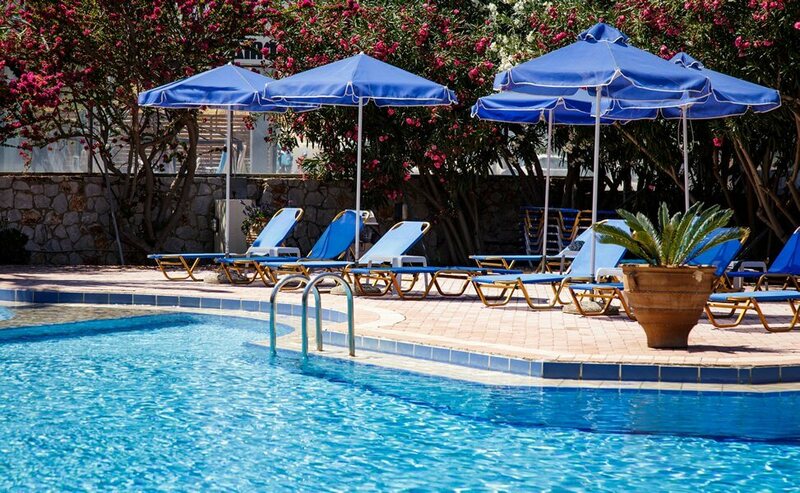 They are extremely well situated for easy access to the beautiful city of Chania and to its famous old Venetian harbor, to the lovely beaches to the west and south of Chania area, and to all the attractions of the west region of Crete like the famous White Mountains (Lefka Ori) and the Samaria Gorge. 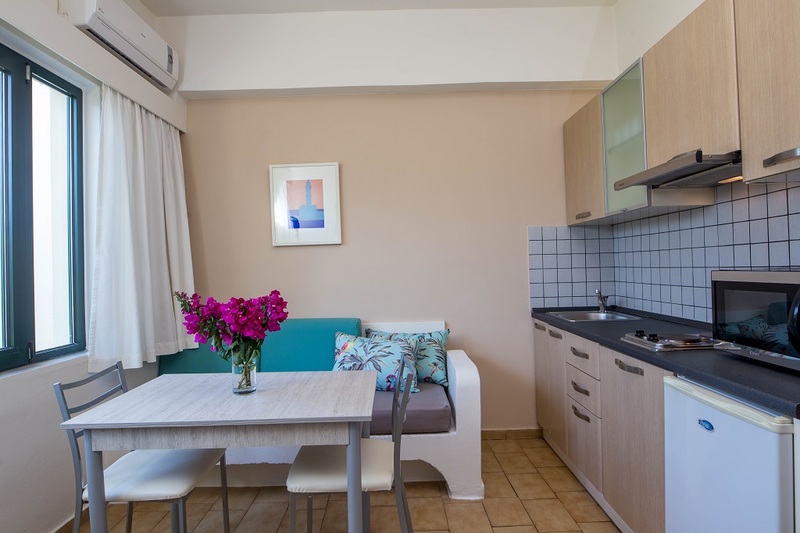 Accommodation at Lefka apartments consists of 8 studios and 8 one bedroom apartments, with large swimming pool, beautiful garden and private parking space. 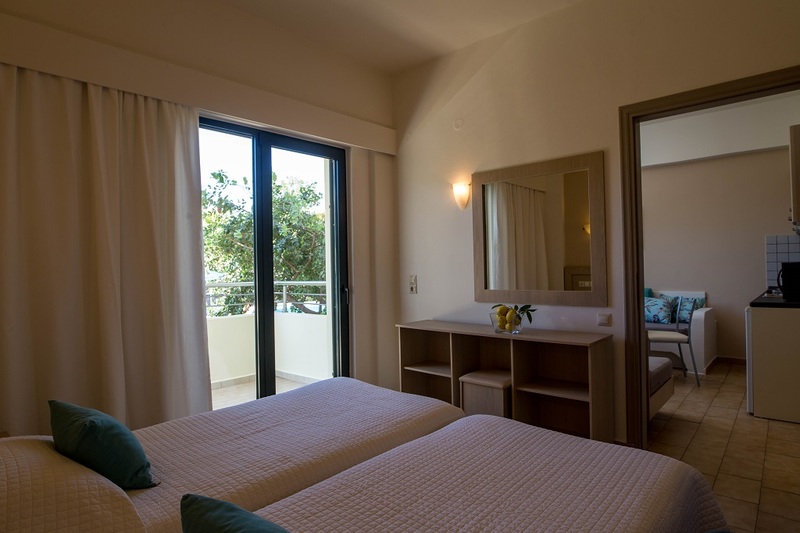 Lefka apartments, open from May 1st to October, is a small family - run hotel, located 2 ½ Kms west of Chania town, with a bus stop right outside and a 15-minute bus service, and 5 minutes walk from Aptera sandy beach. 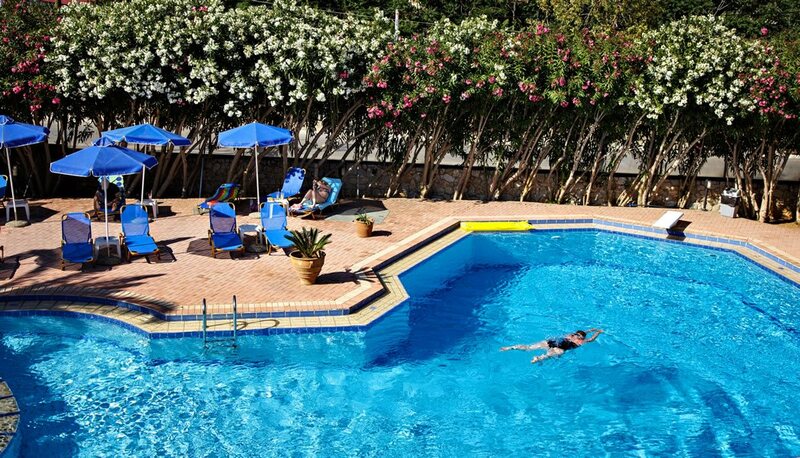 Lefka apartments offer a friendly environment for your holidays in Chania. They are suitable for family vacations and for those who want to have affordable yet comfortable and unforgettable holidays. Lefka apartments are licensed by the Greek National Tourism Organization and are classified as 3 key apartments (the official classification for self-catering apartments in Greece is expressed in keys with 1 key and 4 keys representing the lowest and highest rating respectively). Read our guest book to see what our guests say about their stay at Lefka apartments and their holidays in Chania and Crete or check the Tripadvisor reviews for Lefka apartments. We spent two weeks in September at Lefka Apartments in Chania, what a lovely place to stay, the rooms are well equipped and spotless. Andreas, Evita and Sarah are so nice and nothing is too much trouble. We love Chania and having such good accommodation made it a holiday to remember. We will be back next year. Had a wonderful holiday staying at Lefka last 2 weeks in May. From arriving at Chania Airport where we were met by a taxi arranged by Evita and Andreas to leaving for the airport in another taxi 2 weeks later I can honestly say that this was the best summer holiday we have experienced in many years. We stayed in a 1 bedroom apartment overlooking the garden, it was spotlessly clean, the towels and bedding were changed every 3 days, the bed was the most comfortable I've ever slept in in Greece, there was plenty of hot water for showers, and it was equipped with a kettle, toaster and filter coffee machine!There was a bottle of wine and a bottle of olive oil waiting for us in the apartment, a lovely gesture. Anna, Andreas and Evita were so welcoming, friendly and helpful with information and recommendations about places to visit, transport, and restaurants. Talking of restaurants, the food at Lefka is excellent and in generous portions! The wine is good stuff too! We will definitely be returning! Dear Evita, Andreas and Anna! You made our visit to Crete and Chania an outstanding and unforgettable experience. We enjoyed your hospitality and friendly atmosphere more than words can tell. Nice rooms, great pool, especially our 9 year (and 20 year old !!) daughter enjoyed it, good food, and nightly talks about history. You were very helpful in all that we wanted to do, like for instance renting a car. Nothing seemed to be an inconvenience to you. We whish you all the best and we want to be back soon. Thank you very much, Andreas, Evita, Anna and the rest of the staff at Lefka. You have once again made a great contribution to a wonderful holiday for us. It is the fourth year we visit Chania and Lefka. This year we spent 3 weeks in Crete. 9 days at Lefka and then 9 days of touring the east part of Crete and topping up the vacation with 3 days again at Lefka. Lefka is like a home away from home. We have visited many nice places at Crete and met nice people but nothing can be compared with the friendliness, hospitality and helpness from Andreas, Evita, Anna and the others at Lefka. The first week at Lefka, our daughter and her family in law celebrated a birthday, with a great birthday meal put together at the pool bar. No taverna can beat that meal. We enjoy staying at Lefka in the comfortable apartments and cooling off at the pool bar after a day on the beach, in the town or a tour. Chania is the the best town in Crete, specially if you go a little away from the most touristic places. We can recommend the place with pleasure.